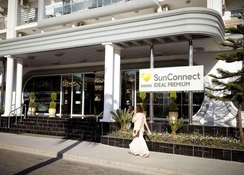 The plush, modern Sunconnect Grand Ideal Premium complex provides guests with a 4-star holiday that offers all that they need and more. This magnificent hotel has facilities that ensure all guests are catered for including outdoor pools and a sun terrace that offers the ultimate in relaxation. All rooms are comfortably designed with a bright and contemporary design while the in-house restaurant serves up a selection of dishes throughout the day. As far as activities and entertainment go, the hotel has something for everyone. Outside of the Sunconnect Grand Ideal Premium, guests can head to the water park, shopping centres or try their hand at the many water sports on offer. 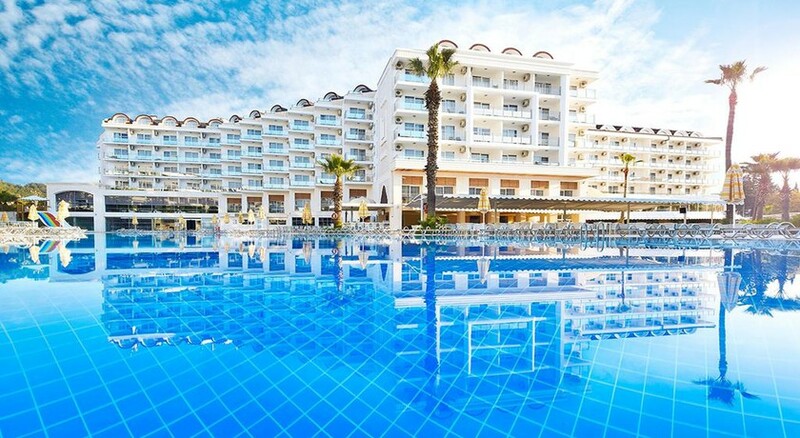 The hotel is perfectly located in Marmaris City Centre with the beach just a hop away. It is ideal for those looking for a relaxing sunshine holiday and perfect for those who like a touch of adventure and excitement. With shops, bars and restaurants in the area, guests can find all that they need while the water parks and water sports are ready and waiting for eager thrill seekers. There are shopping centres and museums to explore, making the location a great choice for all. The hotel is 37km from the airport. There are Standard and Family Rooms available to choose from and all are styled with a touch of luxury and class, ensuring that guests have a memorable stay at the hotel. 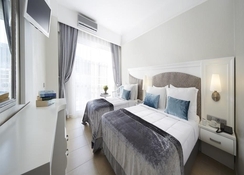 All rooms come with a range of facilities including private bathroom, TV, hairdryer, telephone, safety deposit box, minibar and a private balcony. The plush in-house restaurant allows guests to dine in style where they can explore a wide choice of dishes at meal times. There is a great choice of fresh breakfast and lunch dishes while dinner gives guests access to local and international dishes. Once meal times are over, guests can choose from a wide selection of beverages available from the main bar. 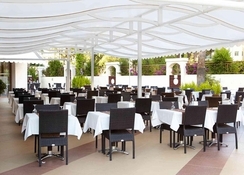 The hotel features outdoor pools that are perfect for adults and children while the sun terrace is the perfect place to enjoy the sunshine with a cold drink. There is a gym for those who like to keep active and a sauna and jacuzzi as well as treatments for those who prefer to unwind and relax. There are activities such as football, basketball, volleyball and darts while the kid's playroom and playground ensure that they are kept busy all day long. I enjoyed every day I spent there. Everything was amazing . The staff were polite and friendly. The service was amazing. Sun beds and pool was great and evening entertainment was brilliant. Also I can’t forget the reps they were also great and 100% all the staff should be appreciated for the work they do! The only thing I would say is that violence should NOT be tolerated what so ever. A man pushed a women and was shouting and swearing at her about the sun beds, he put 3 towels on the sun beds which he then arrived back 4-5 hours later and then kicked off at an elderly lady becsuse she was on them. I’m sorry but he should have 100% been kicked out of the hotel.maybe the staff need to be a little less polite on them occasions. Only down side pool freezing but it was October. One of the best hotels in Marmaris i cant recommend it enough. We went all inclusive and it was worth every penny food was amazing and selection was huge! Rooms were clean and modern. I would stay there again when i visit Marmaris.